I had been on this tour before when I went with my mum and absolutely loved it and thought Luke might too so we decided to book ourselves on it. 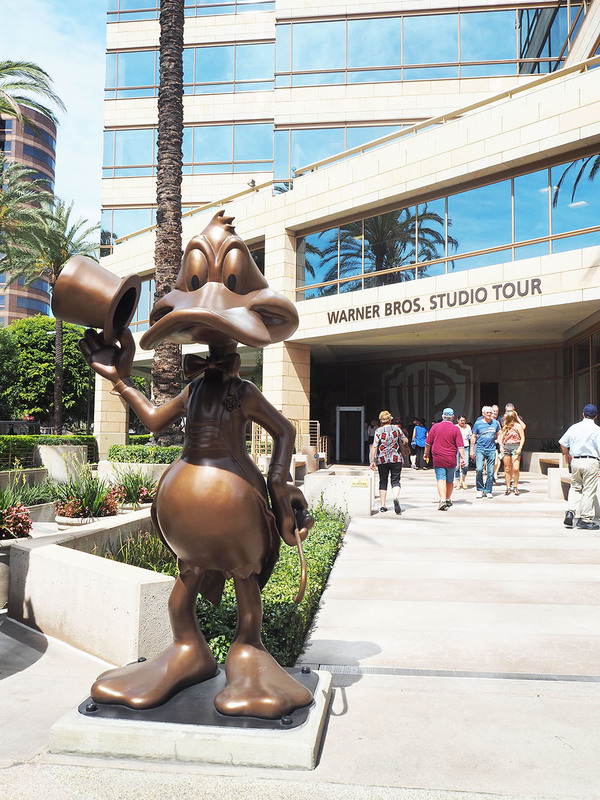 The tour takes you on little golf carts around the outside set areas of the studios and through the streets criss crossing through the huge sound stages that they film inside. Annoyingly I was sat in the middle of a row when we were driving around the outside set areas so I couldn’t take any good pictures. 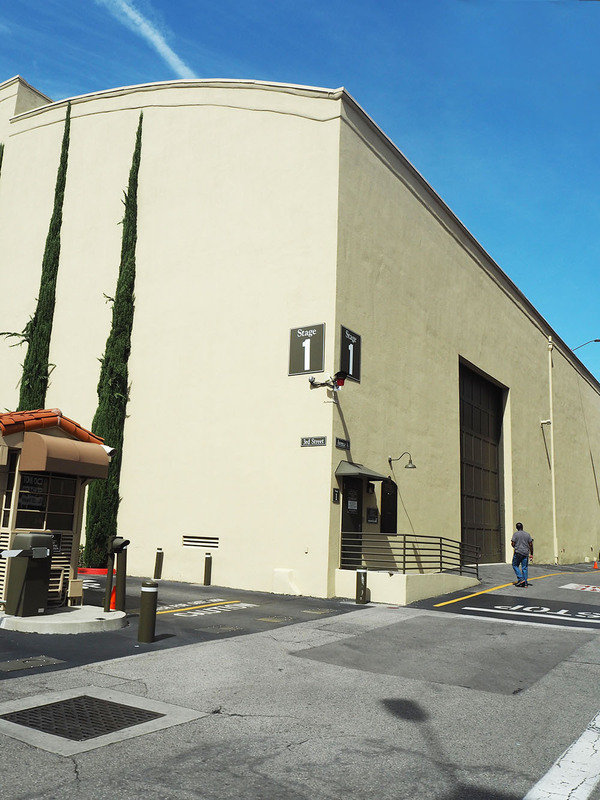 We also were able to go inside one of the sound stages and see where they film the show ‘Mom’. 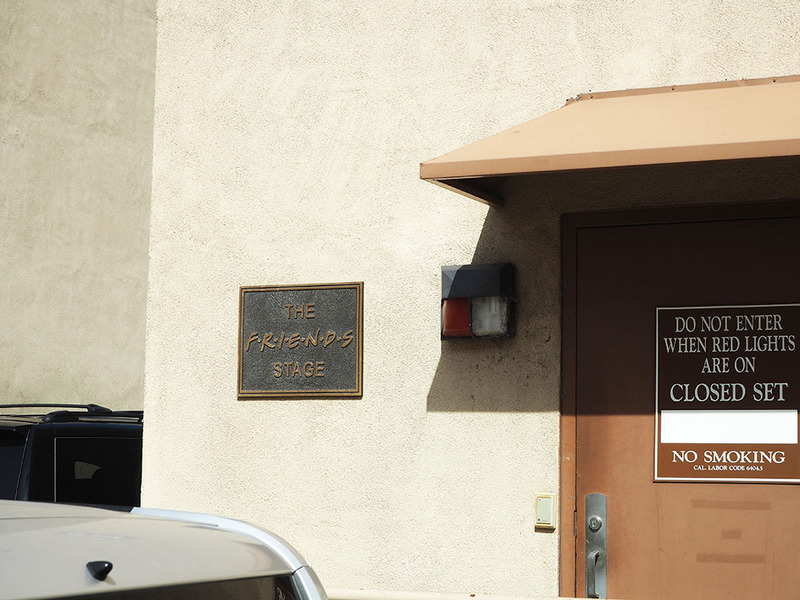 It’s really interesting to have a look inside and see how shows such as Friends would have been filmed. When I went last time I got to see the set of Two And A Half Men. The tour is really interesting but I do feel a bit sad that I had something to compare it to as the time I went before was actually a bit better. 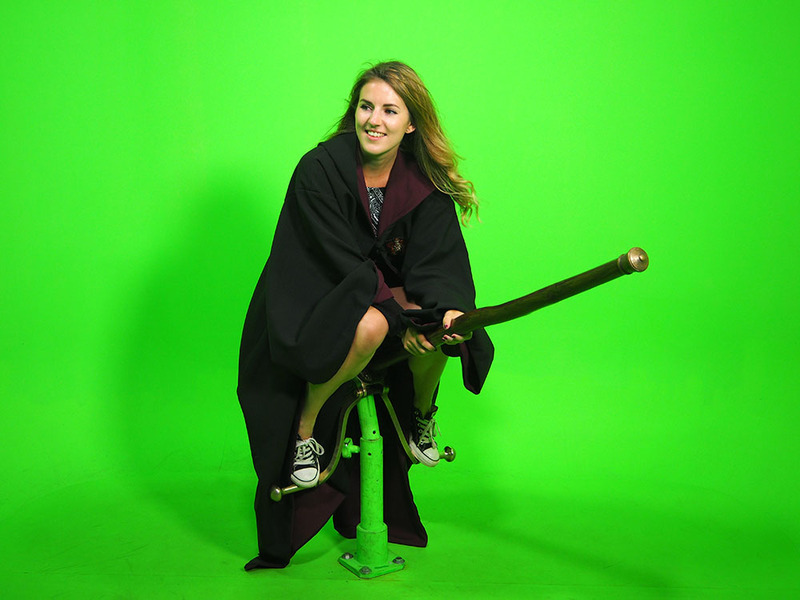 We got to walk around a props storage area and a huge display of Harry Potter costumes and props, and famous costumes from a whole bunch of movies. We didn’t do any of this on this tour as I think they have changed it a lot since I last went. 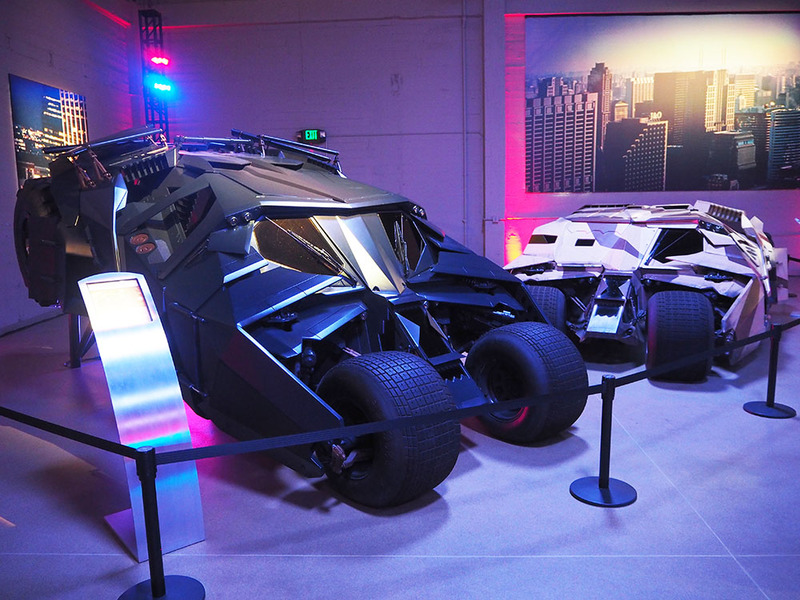 We also got to see all of the Batman cars that have been used in all the Batman films. Again this was really interesting but last time I saw cars from a whole load of different films. They must change up their exhibits obviously to keep people coming but it was a shame that last time the experience was a bit better. I don’t mean to sound really downer on it, it just wasn’t quite as good as I was expecting. 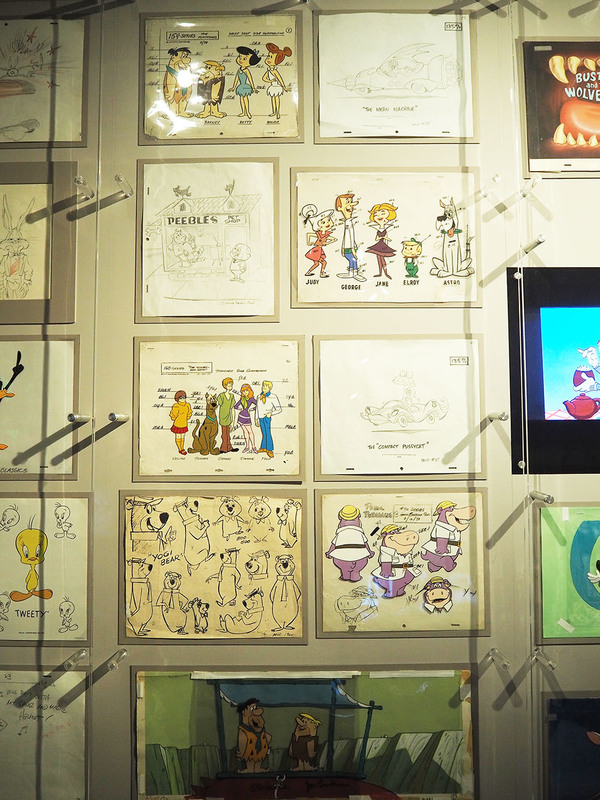 But it was still great to see all these props and get an insight into how TV and movies are made. You can actually go and watch shows being recorded in the studios, you just need to check the website and see when tickets are available. Unfortunately there was nothing on while we were there which was a shame but if you fancy it then its definitely worth looking into! 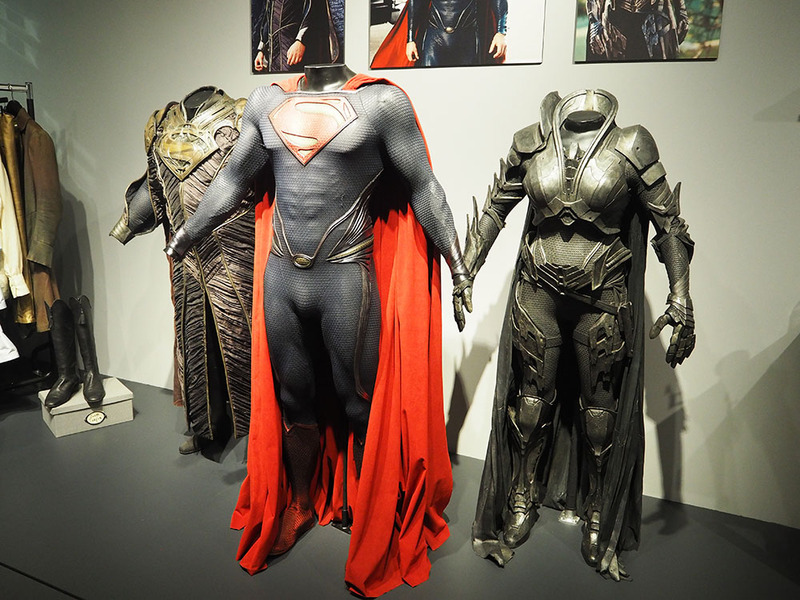 I think the reason they had changed the tour so much from the last time I went was because they had created a whole new purpose built building housing drawings, costumes, props and set pieces from loads of different films and movies. So half of the tour time is now left for you to self-guide yourself through this area. Personally I would rather spend more time out on the lot seeing the real goings on, but if you like stuff like these displays then it could be just up your street! 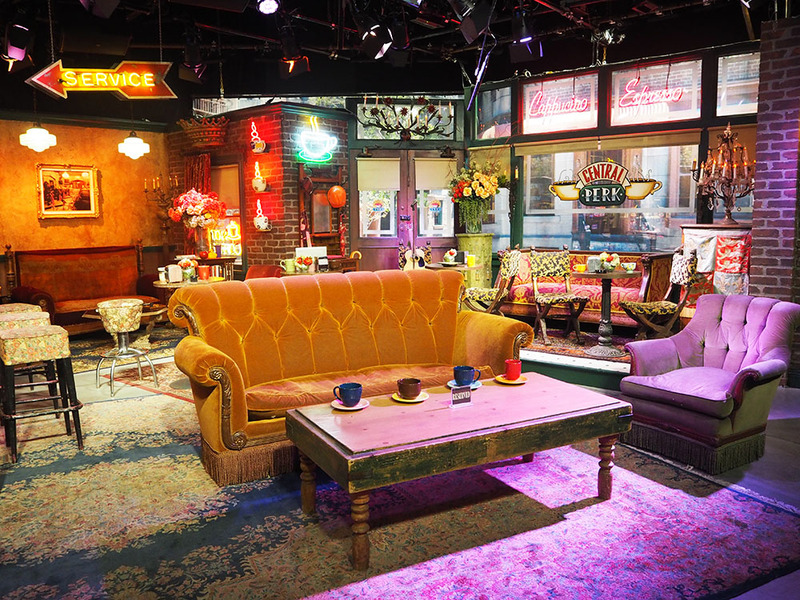 One thing you do get to do that I didn’t last time was sit on the famous Friends couch. They have reconstructed this area in the self guided part of the tour and you can queue up to have your photo taken on it! I say queue, but there was only one group in front of us so you shouldn’t have too much of a problem waiting for your turn! The attendant just takes your photo on your phone or camera so its free to have your photo taken, even better! 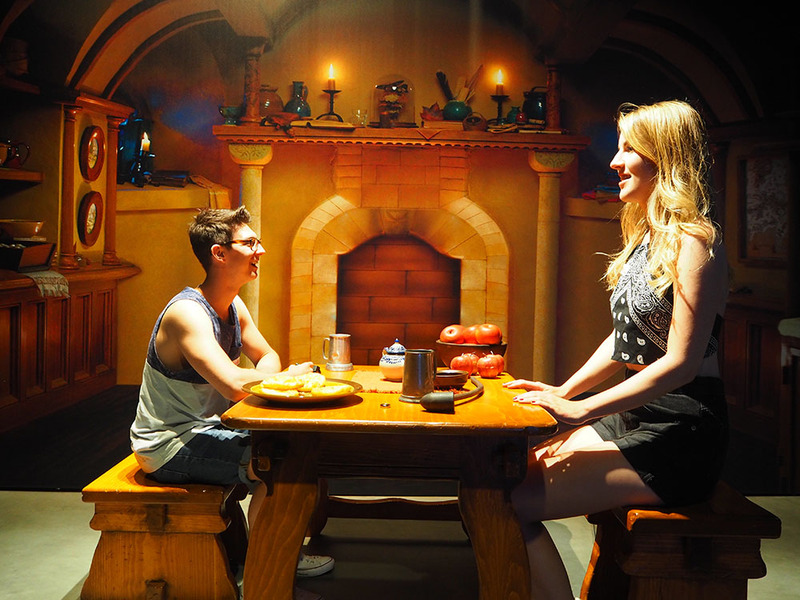 They also have the perspectives table that you can have your photo taken at. I still don’t know how this optical illusion works, I look huge! A key part of this building that they have set up is an area to get those computer generated photos taken. You can go in them and get your photo and videos taken but you don’t have to buy the photos or video, you can just do it for the experience. There isn’t any obligation to buy. So we just posed on them and took our own photos. 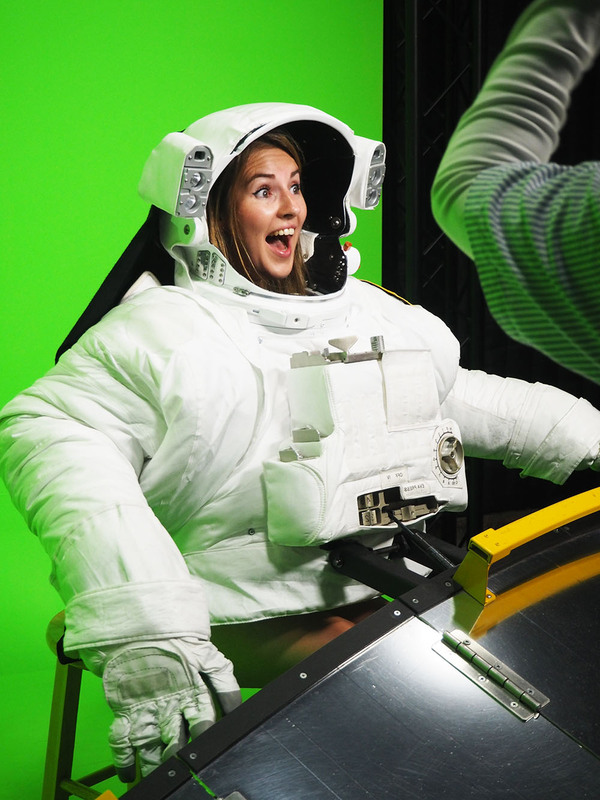 This is my shocked astronaut face. Here I am sporting my SRS SRS Batpod face. 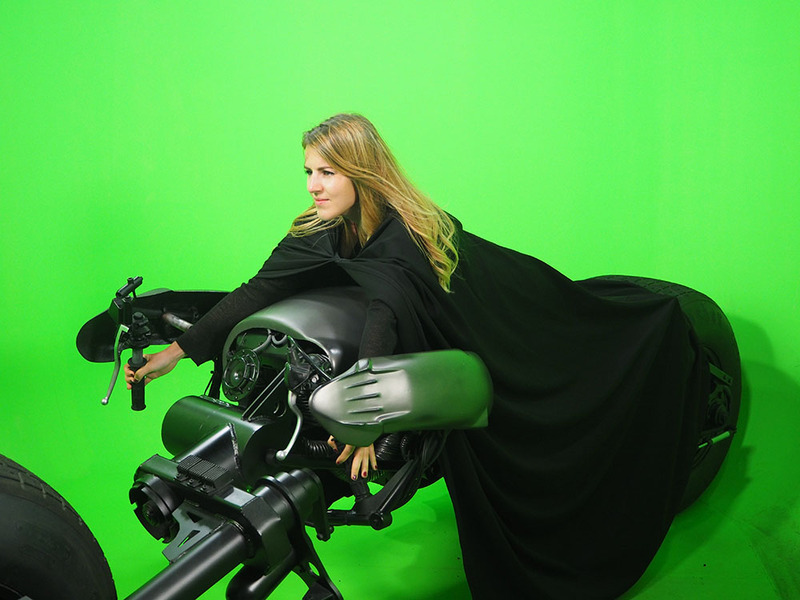 And my casual just sitting on a broom in a robe face. We also went into a short demonstration in this part of the exhibit of how they layered the audio tracks in the movie Gravity which was super interesting. Although the experience wasn’t quite as good as previously it still was really good to see it all again, and Luke really enjoyed it. 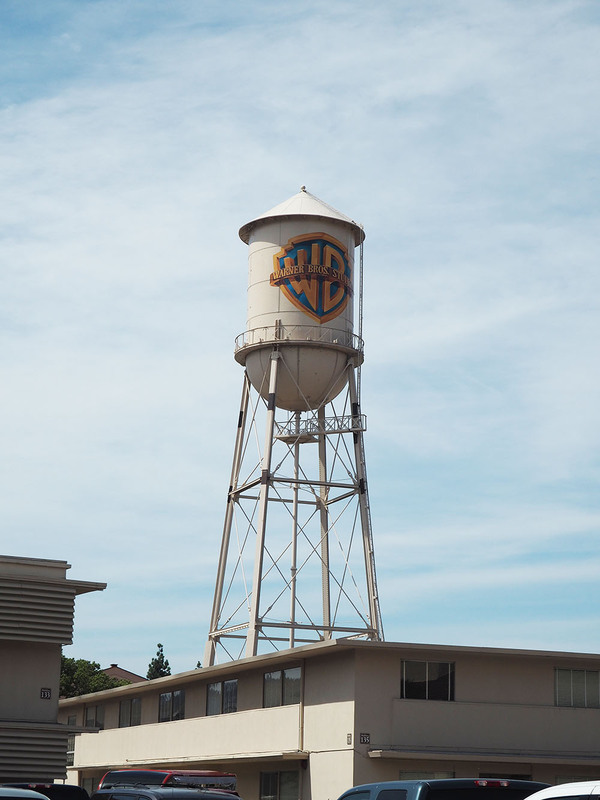 I think next time I would look into Paramount Studios as they also do a tour and I would be interested to see how that one compares. 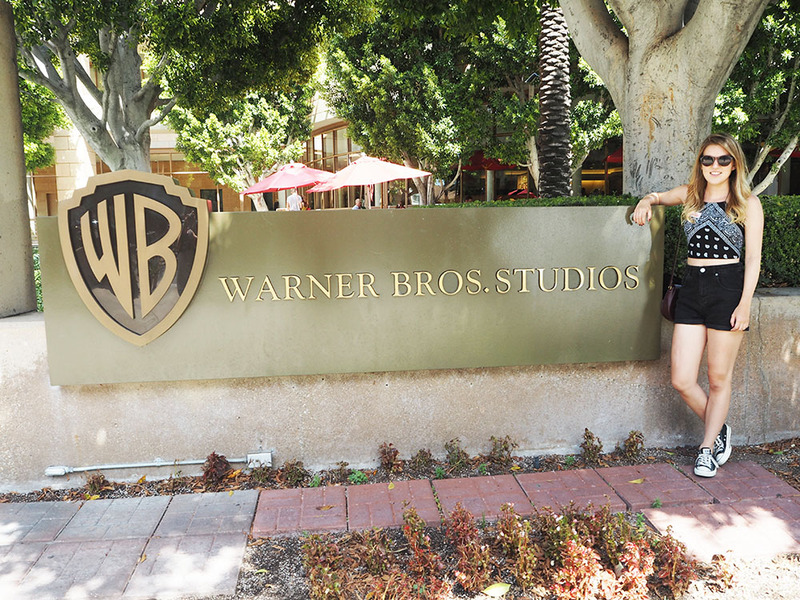 After we finished at Warner Bros. we then went on a Stars Homes tour. I didn’t actually take any pictures on this tour because I did that last time I went and then had no clue who’s house was who’s once I got home! 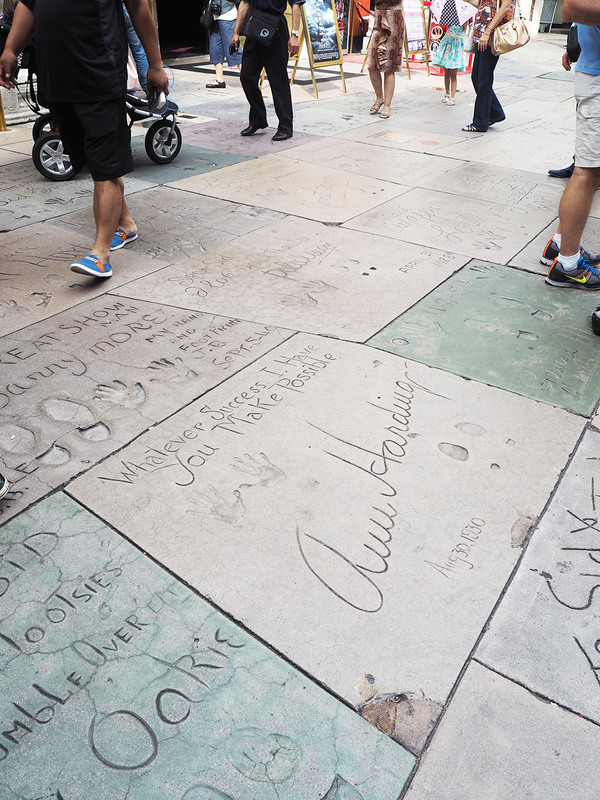 But if you like that celeb stuff definitely go on a tour to have a nosy how the other half live! Some of the houses in those Hollywood Hills are unbelievable. 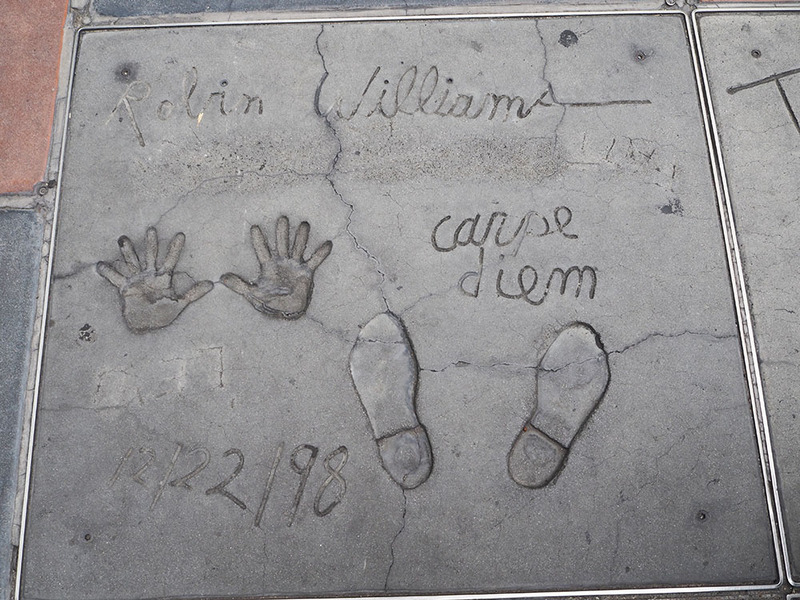 Once we got dropped back by the hotel we thought we had better go out to Grauman’s Chinese Theatre and get a few snaps of the famous hands and feet. Just sizing up my teeny hands to Arnie’s. And I had to get a picture of this legend’s plaque. Such a great man. Once we got back to the hotel properly we decided to have a quick peek at the pool. As you can see it was a really cloudy day so we didn’t fancy donning our swimwear to sit by the pool for a bit. But just look at how awesome that rooftop pool is. 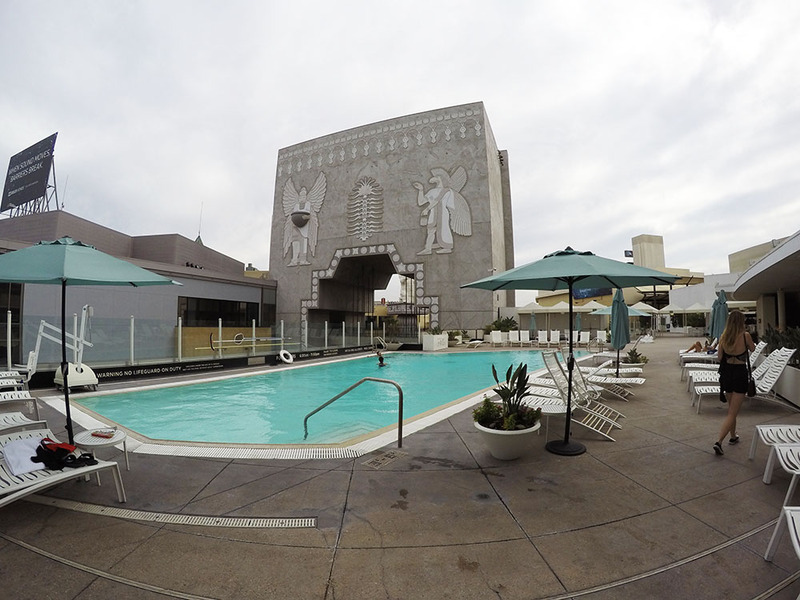 When I go back to LA I would definitely stay in this hotel again! 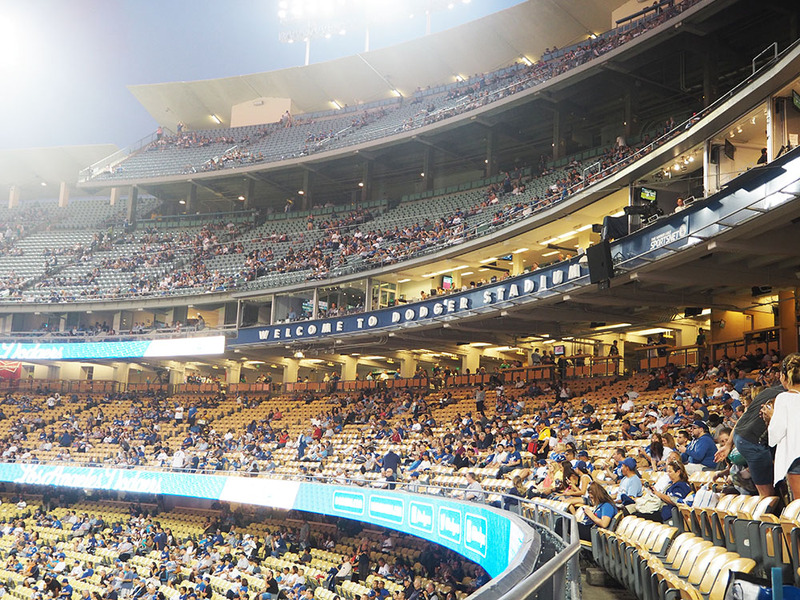 After a quick wander around we got changed and jumped in the car to go to the main event of our night, to catch a baseball game at Dodger Stadium! Again this is something I had done with my mum back in 2010 and I absolutely wanted to do it again. In 2012 I bought Luke tickets to a Yankees game when we were in New York and we really enjoyed it so we thought why not see what the other coast has to offer. 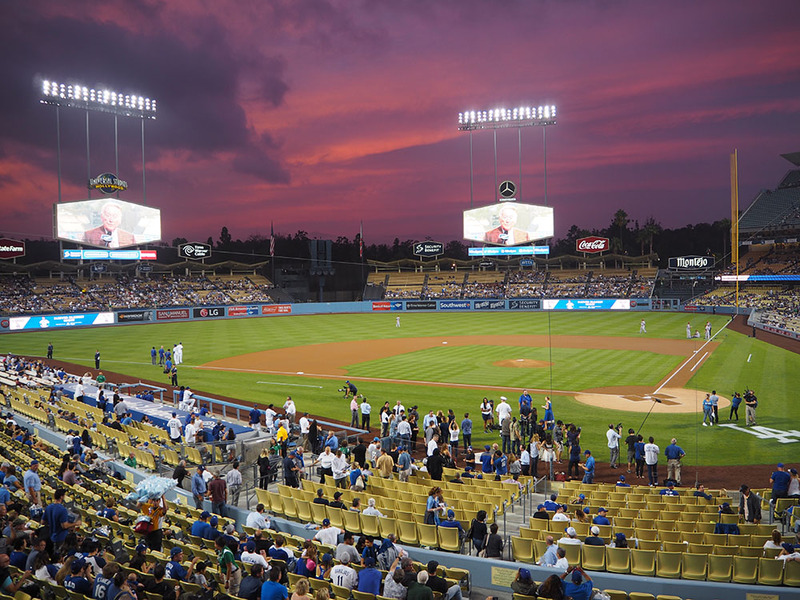 The Dodgers were playing the Arizona Diamondbacks on the night we went. 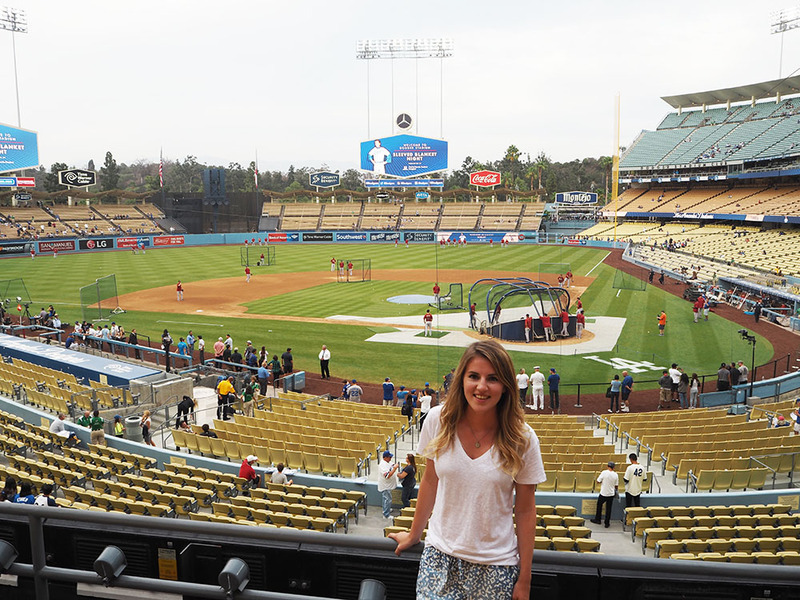 We booked it all in advance from the UK which was super easy to do through the Dodgers’ website. We even pre-booked our parking. This was the view from our seat. We did a bit of research before we booked to see where people recommended you sit. We found this website really helpful. In the end we sat in Section 115LG Row A, just in case you wanted to get a rough gauge if you’re thinking of booking. We went to an evening game which was perfect as it wasn’t too hot like it was in the daytime. Back in 2012 at the Yankees it was boiling hot and a guy in front of us actually passed out and they had to get a medic in and everything because he wouldn’t wake up to begin with. Scary stuff! Make sure you stay hydrated kids! Anyway back to the Dodgers. That is a real life picture of what the sky looked like as the sun set. It doesn’t even look like it could actually happen and be that colour. Crazy! 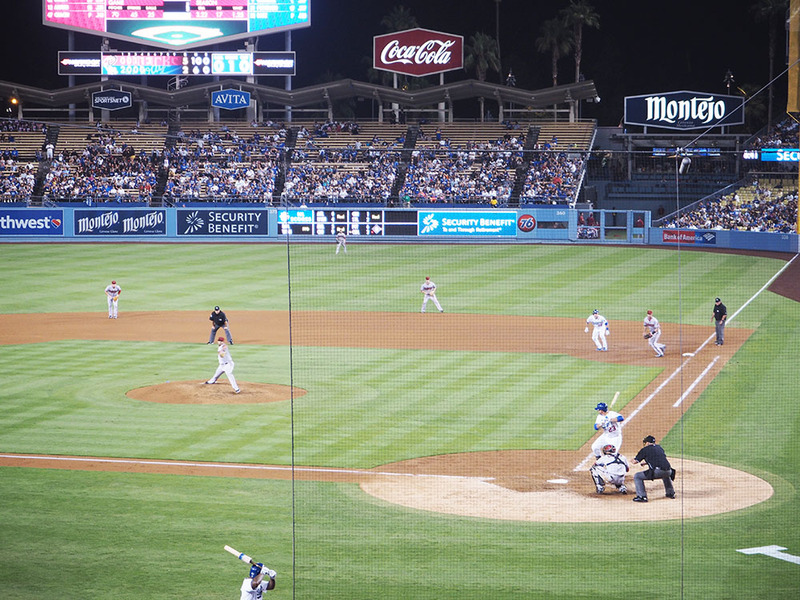 Unfortunately the Dodgers played terribly and lost. Baseball is such a strange game, people seem to leave before it’s over as if they’ve decided its not going to get any better so they just leave. We couldn’t understand all these people leaving so early on when they’d paid for tickets. Madness. We stayed till the very end to make sure we got our moneys worth! Haha. I’ve also decided I’m quite the baseball fan now. I think I have grasped the scoring and how it works. And the atmosphere is so awesome. I love all the animations that come up on the screen and how everyone sings the Take Me Out to the Ballgame song. We even came away with a free sleeved blanket printed with the Dodgers kit on it. Now if that isn’t a reason to go to baseball I don’t know what is! After the baseball finished we decided to be naughty and get some late night pancakes. 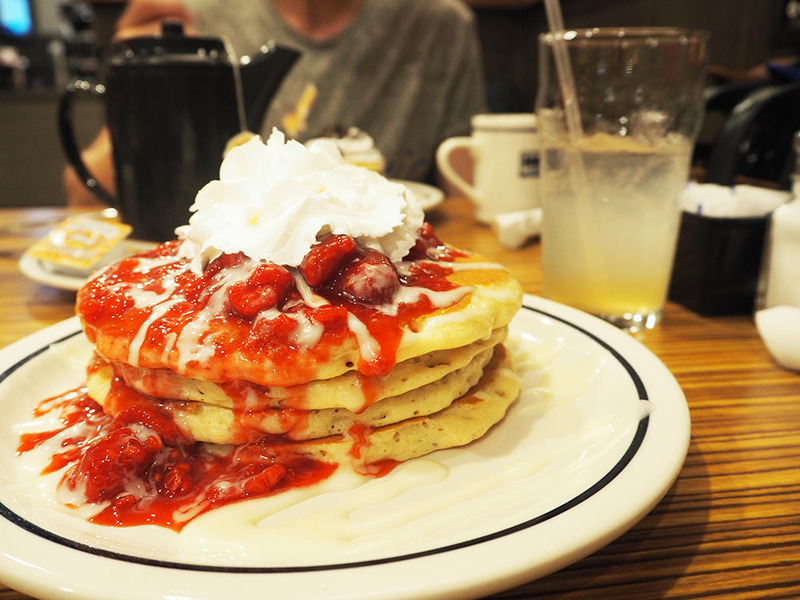 Why aren’t there iHops in the UK serving pancakes at all hours of the night? A stack of strawberry pancakes at 11.30pm should be a standard offering no? By this time we were realising our trip was coming to an end and we were going home tomorrow so we had to make the most of every minute! Including naughty night time treats!